One of the world’s great violinists will perform Brahms’ Concerto No. 1 in D Major, Op. 77. Since her debut with the New York Philharmonic at the age of 8, Chang has performed with the most distinguished orchestras, conductors and accompanists internationally. Her extensive discography and constant touring are a testament to her absolute mastery of chamber music. 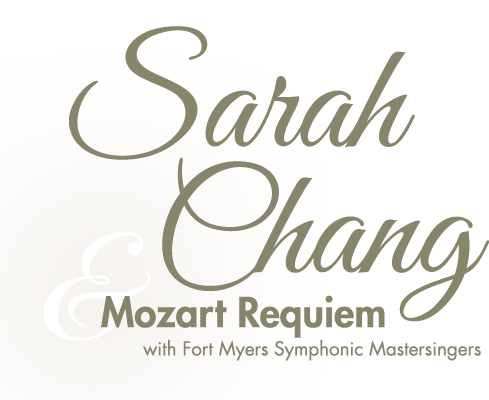 The Fort Myers Symphonic Mastersingers and guest soloists Ilana Davidson, Claudia Chapa, Jorge Garza, and Branch Fields join the Gulf Coast Symphony to perform the Southwest Florida premiere of Robert Levin’s completion of the Mozart Requiem. The creation of this choral masterpiece is shrouded in mystery – one that makes the piece all the more fascinating and emotionally stirring! Johannes Brahms (7 May 1833 – 3 April 1897) was a German composer and pianist of the Romantic period. Born in Hamburg into a Lutheran family, Brahms spent much of his professional life in Vienna, Austria. His reputation and status as a composer is such that he is sometimes grouped with Johann Sebastian Bach and Ludwig van Beethoven as one of the “Three Bs” of music, a comment originally made by the nineteenth-century conductor Hans von Bülow. Wolfgang Amadeus Mozart was a prolific and influential composer of the classical era. Born in Salzburg, he showed prodigious ability from his earliest childhood. He composed more than 600 works, and is among the most popular of classical composers. His influence is profound on subsequent Western art music.